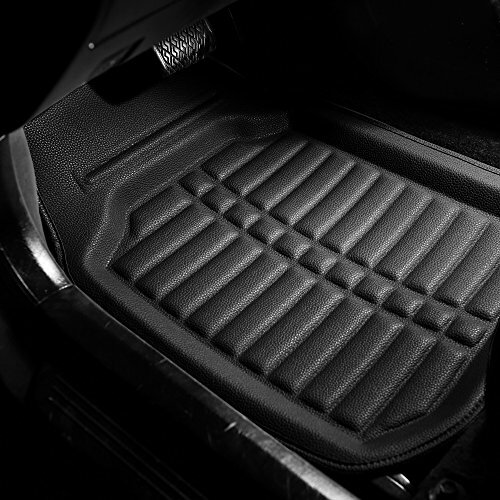 A high-quality car mat can protect your vehicle’s carpeted interiors from a lot of abuse, including soiling from water, mud, and other chemicals, as well as general wear and tear from footwear. Though you can get carpet-based car mats, the products crafted from more durable materials such as rubber will last much longer. Below, we’ve covered 5 of the best options available to you right now. The Weathertech W239 car mats don't come cheap, but they are high-quality rubber mats that fit many makes and models extremely well. If you’re looking for protection for your rear foot well too, then you may want to look elsewhere; otherwise, you won’t get much better for your money. 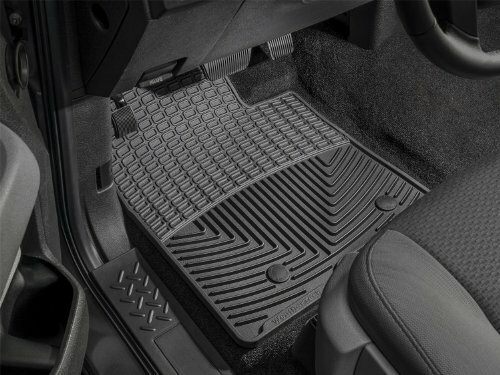 As well as deep groves and ridging, these mats have stopped built-in, which allow them to be secured to notches in the foot well if they are included with your vehicle. When in use, these stoppers completely immobilize the mat and prevent slippage underfoot. 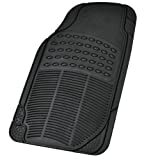 Due to the high-quality of rubber used in the making of these car mats, they maintain their shape well, even under heavy use and lots of footwear. They also have deep groves and ridges etched into the surface, which are perfect for catching dirt, debris, and water, keeping all of it off your vehicle’s carpeted interior. This set of car mats only includes 2 pieces, enough for the front foot wells of your vehicle; this means no protection for your rear cabin. For a product at the expensive end of the market, some people may find this lacking. The other problem is that you can only get these mats in black. Still, these are only simple drawbacks. 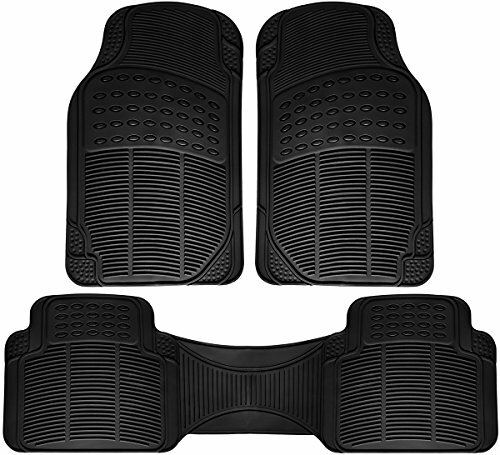 Price-wise, this 4-piece group of car mats includes both front and rear protection for your foot wells, as well as trunk protection, though they’re also the most expensive on our list. These mats are heavy-duty and all-weather resistant, guarding against dirt, debris, and moisture, making them ideal for those who engage in outdoor sports or other activities. The mats will stop stains from affecting your vehicles carpet. Measurements: Front 31.5 x 22.5 / Rear 18 x 58 / Trunk 31.5 x 50 in. 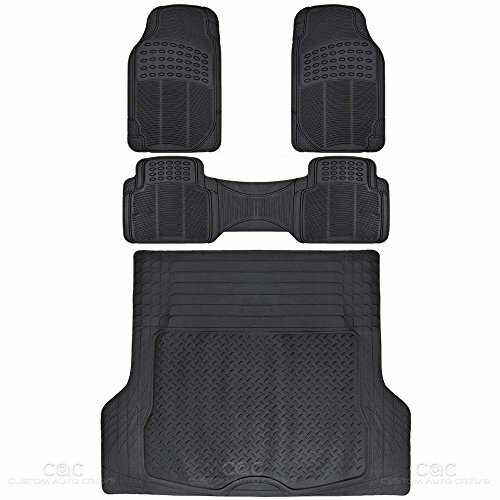 Many kits include front and rear protection, though this set extends to offer a Cargo Liner, which covers the base of your trunk to protect the carpet beneath. The mats are built from heavy-duty rubber that is odor-free fresh out of the packaging, as well as being non-toxic. Car mats won’t fit every make and model straight out of the packaging, though most can be trimmed down. These mats are very easy to trim, as they’re made from thick and flexible rubber that won’t easily rip and tear. The thickness also helps to stop the mats from slipping around beneath your footwear when placed in your foot wells. Overall, the price of these mats fits the quality of the product; they’ll stand the test of time when exposed to wet and dirty conditions. 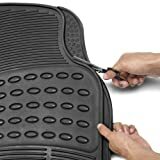 Though it’s a situation that affects many other car mats, these will need to be trimmed down to fit most makes and models. This is largely due to the fact that the front and rear mats vary so much in size. In terms of the rear car mat, it’s a single piece rather than 2 separate mats, and much smaller than the front pieces. Lastly, although the rubber is thick and durable, it’s also very soft; over time, this could lead to flattening, which would reduce the liquid-catching capacity of the grooves. 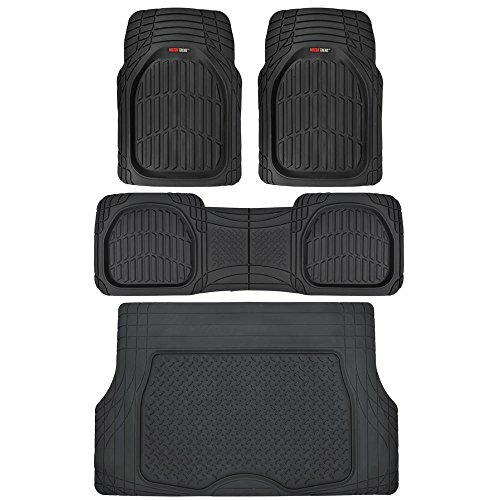 ProLiner have produced a 4-piece set of reasonable quality with this car mat bundle, which are also well-priced. Though not as durable or well-designed as some competitors, they’re suitable for somebody looking for a cheaper option that won’t fall apart. These mats feature all-weather, all-season protection against rain, snow, mud, and debris, as well as being stain-resistant. They have strong anti-slip properties on the underside, and decent grip on top, too. It’s unusual to see protection for all front and rear foot wells, as well as the trunk, for such a reasonable price. Design-wise, the mats feature an anti-slip design that helps keep them secured. All the mats are built from easily cleanable rubber. 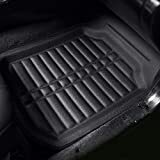 The rear cabin mat is just a single piece as opposed to 2, so it will only suit vehicles that don’t have segregated foot wells. In terms of design, there is no outer lip designed to catch water, plus the actual ridges that the mat has are shallow, culminating in poor water-retention properties. This mat, produced by brand FH Group, is a high-end car mat specifically tailored for color matching against existing car decals or accessories, with a vast range of color options available. However, they’re not cheap, especially for something as difficult to clean as faux leather. This mat is unique compared to others that conform to the same type of design. Using a different kind of material, it forms a basin design that traps all kinds of liquid and debris. Colored trim adds a touch of style and an anti-slip backing helps secure the mats in place. Though faux leather is more lightweight than rubber, it is also harder to clean. The mats do a good job of collecting excess water, but dried mud can be tricky to remove. They’re also reasonably expensive for just one piece and this piece cannot be trimmed down for smaller foot wells. 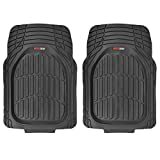 The OxGord Universal Fit Rubber Floor Mat comes in a set of 3 pieces, with 2 trimmable front-seat mats, plus a rear runner to cover the full width of the back footwells. Price-wise, these mats are roughly average and can be chosen from a range of 4 colors. These OxGord floor mats can be purchased in one of 4 distinct color designs and feature heavily durable rubber that won't tear or rip under the stress of heavy-duty footwear. What’s more, the specific dimensions used have been modelled on the most commonly available vehicles on the road to increase the chance of them being compatible with your car, SUV, or truck. Regardless, they can easily be trimmed down to size should the need arise. A heavily grooved design helps these heavy-duty mats to trap lots of dirt and debris, so that it can easily be shaken out after each journey. The highly resistant design also makes them easy to hose off and clean without causing any water damage. Comparing the price against quality and the materials used, this product offers fair value for money, and we also like the customization options that allow you to match both the interior and exterior of your car. 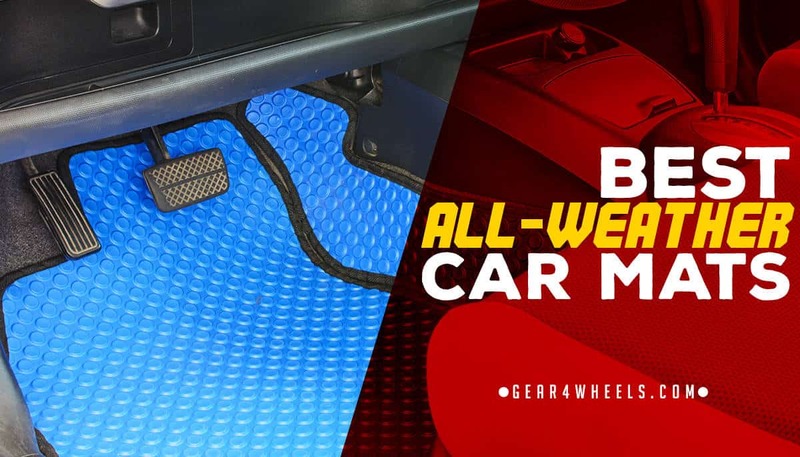 These mats have the common issue of a chemical odor when first removed from their packaging, though this does subside after a period of several days; thus, it’s worth removing them and allowing them to air out before introducing them into your vehicle. Another common complaint amongst single-piece rear mats is that they have a worse fit than those in the front. Otherwise, the only other complaint is a lack of any grips on the underside to help prevent slippage, but they do at least have grooves underfoot. When it comes to sheer durability and quality, our pick of the products above must be the Weathertech W239. These mats may not be the cheapest, but they’re certainly some of the most well-built, with strong water-retention qualities, too. The stoppers will hold them in place, while a thick, durable design will resist ripping, tearing, or flattening.